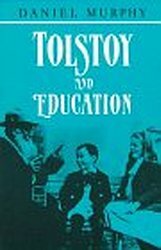 This book attempts to fill a lacuna in Tolstoyan scholarship – the need for a comprehensive assessment of Tolstoy’s life and work as an educator. Categories: Education, Literature and Criticism. From the time he founded his first school, when he was about twenty one years old, right up to the end of his life, Tolstoy was consistently involved in education, and was deeply committed to bringing about fundamental reforms in the practises he had observed in contemporary schools and other educational institutions. Murphy is senior lecturer in education and a Fellow of Trinity College Dublin.